Our first design in our Christmas Series this year is the Christmas Sugar Cookie. We love baking with our family’s and sharing the magic of the season. We make Sugar Cookies every year! The color possibilities for this design are endless..from Frosting to Sprinkles. We can’t wait to see what you create! We hope you enjoy making your very own Christmas Cookie! When you complete one, please post it in our Facebook group or tag us on Instagram #3amgracedesigns. We love seeing your work! *Note: Christmas Cookie is worked in a continuous round. Do not join. 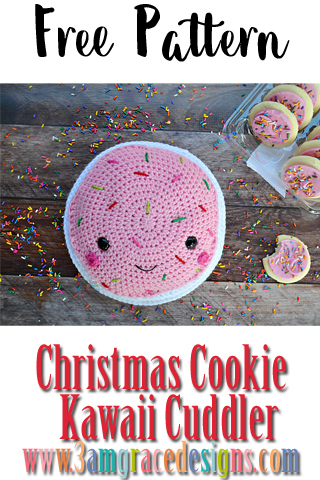 * Sew or glue Cookie Frosting onto top layer of Cookie Body. * Place safety eyes between Rows 7 & 8, roughly 18 stitches apart. * Using puff paint or embroidery floss, create desired mouth. 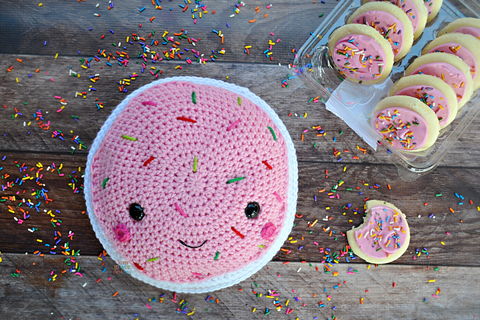 * Create Sprinkles in desired locations using Limelight, Green, Red, & Hot Rose yarn. * Align Cookie halves so ends of rows match. Single crochet around both pieces to join together. Stuff with Poly-Fil prior to completing stitching. Make sure you work in a counter-clockwise direction so your stitches face forward.